Bath time in our house has never really been a dreaded part of the routine. We all love it now. If the water starts running in the tub/shower both Austin and Brookland come running to see if it’s a bath for them, and if not, Brookland especially, leaves the bathroom pouting if not crying. Austin didn’t always, in fact she was probably close to four months old before she accepted it. At about eight months, in a hotel tub, laying on the bottom with only an inch or so of water, was the first time she laughed in the tub. She soaked me and that bathroom with such a small amount of water, but boy did she have fun. Brookland has loved the bath since her first bath at home, even her first bath in the hospital wasn’t that bad. She has never had a fear of water, and has never, never, cried in the tub. Austin was a little older when I discovered JOHNSON’S® NATURAL®, and I couldn’t wait to try it out. I used it for her, and with Brookland. 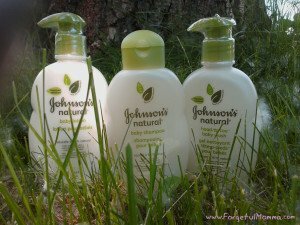 I am excited to use the new and improved JOHNSON’S® NATURAL® baby products which are paraben-free, dye-free and phthalate-free, for our little boy once he is here. You can learn more about JOHNSON’S® Baby products here and on their Facebook page. Disclosure: I received the above products, and will be receiving compensation, in exchange for this post by Johnson & Johnson Inc as part Mom Central Canada. All opinions are honest and my own, I am not influenced in any way. Previous Post: « It’s Tuesday Giveaway Link Up Time!